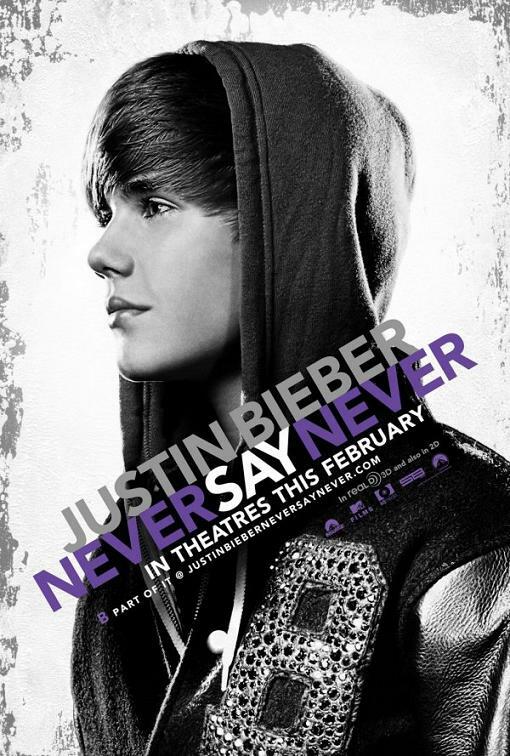 The Reel Rhino: Bieber's Never Say Never - REDUX - Watch the Video! Bieber's Never Say Never - REDUX - Watch the Video! The Reel Rhino is a humble animal. This past Academy Awards, some 12 contestants, myself included, took a run at the title. I hosted an Oscar Pool, and while I as host, came in a paltry 6th of 12, I offered as a prize a chance for the winner to pick a movie that I would review. Out of the gate, I was irritated that for the limited opportunities I get to break away to go to the movies, that I would have to waste a day at the theater on the Biebs. Wow Sommie…all I can say is…thank you! I was absolutely blown away at how compelling this film was, from a variety of perspectives. This was the first ever G-rated offering from the folks at MTV Films and boy did they play this thing just right. At 1 hour 45 minutes, compare this for a second to the sickly short effort by the Jonas Brothers, which came in at a little light for my $ at 76 minutes. Yes, I did see the Jonas Brothers movie...I did to see what a concert movie of this type would look like. I did it for you folks. Now I guess comparing the Jonas Brothers film to Bieber is an unfair comparison, as most of the Jonas’s flick was 3-D concert footage. 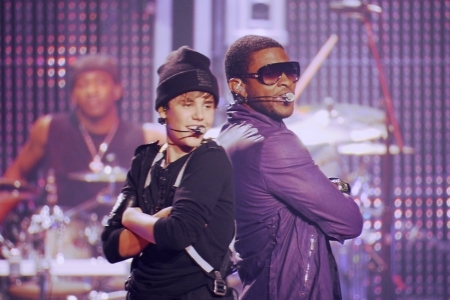 The Biebs flick, is very much a documentary. It is a documentary that is so well made, I feel confident in saying that at the very least, this feature will make the documentary short list for next year's Academy Awards. You can call me crazy all you want, but this is an excellently composed film that shows this superstar’s truly meteoric rise to fame and fortune. I hope that the Academy will be able to look past the pop sweetness of this thing and see the respectable, wholesome, and entertaining center of this film. The first quarter of the movie focuses on Justin Bieber’s early years, which is hilarious as he is now only recently turned 17 years old. As a young child, he demonstrated a knack for playing drums. It turned out that there would likely be no instrument that he couldn’t conquer. The film shows his knack for melody and rhythm, both through instruments as well in his voice. Justin lived away from much of his family and wanted a means for sharing his songs. It was this obstacle that opened the door for him to start his walk towards stardom. His mother began posting his songs on YouTube so that long-distance relatives could see his talents. As with all things viral, his presence soon became known worldwide and he was climbing the ladder of success. While I think the motto of Never Say Never is a tad bit corny, it apparently fared well as the fight theme from the Karate Kid remake. And I guess as I praise this film for its positive message, I shouldn't condemn this positive message he is trying to convey. Bieber and Jaden Smith even come together to collaborate at the big Madison Square Garden gig, that the film is building towards throughout the movie. This movie highlights the essence of self-made stardom. Granted once he teetered on the edge, the free fall was easy. Many of those with two X chromosomes will tell you why...ladies find this kid irresistible. And that would be ladies of all ages, as Never Say Never awkwardly showed us. I may not like his music, although some of it is passable for my tastes, I look up to Bieber for what he was able to do in such a short while, on his road to fame. He is as humble as stars come and his story is both great in general, and tells well in the feature film format. He has become a part of our popular culture...you really haven't made it until you get a guest spot on C.S.I., right? And what of Bieber's music being the subject of a Glee episode? I for one was a much bigger fan of that as the offering of super sugary pop fare, but I am a self-admitted Gleek...yep, you heard it here from the source, so it must be true. Glee is a fantastic show that is a bit over-dramatic, giving it a parody-feel, with real heart. If you haven't tried Glee yet, go back to the beginning and give it a whorl. Perhaps it all stems from my super secret fantasy of being a part of a spontaneous dance number some day, but that is a bit of discussion for another day. That first quarter of the flick was riveting and the rest was damn good as well, taking us on an adventure with his boyhood entourage, meeting his family, and surviving a strained vocal chord scare. I say all of this straight-up, no sarcasm…this movie was fabulous. I am not a Justin Bieber fan, but I respect and enjoyed this film. I don’t care what it does to my street cred (did I even have any? ), I recommend seeing this movie. More so, I recommend seeing this movie in the theater, in glorious 3-D, if the opportunity presents itself. This was a 5 of 5 Horns film, so says the Reel Rhino. Don’t believe me, see it for yourself. Just remember not to bite off your nose to spite your face (I hate that phrase! )....but it's true here...don't pre-judge. Give this a chance. Thanks again Kristin, you opened my eyes to something I can honestly say I wouldn’t have seen in a million years. That, my friends, is the power of cinema. If you take nothing else from this review, know this: the Reel Rhino makes good on a bet made, no matter the cost to pride or self-respect. It reminds me of something wise I heard once…never gamble what you are truly afraid to lose. And before I close the book on the Biebs, check out this parody video from You Tube by The Key of Awesome...it is simply...awesome.